Chronis Koutsoumpides was born in June 22, 1986 in Ptolemaida, Greece. 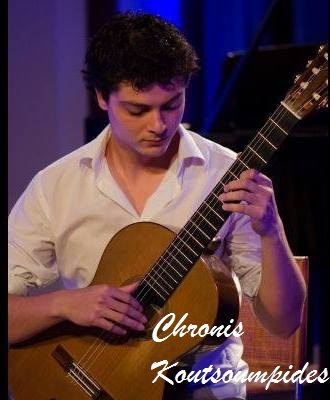 At the age of 7 he started his musical studies and in 2007 he received the guitar diploma by the Municipal Conservatory of Ptolemaida with Honors, First Prize and a distinction of outstanding performance, studying the last 7 years with a scholarship. At the same time in 2005 he received the Harmony degree. In 2009 he graduated from the Department of Music Science and Art of the University of Macedonia from Elena Papandreou’s class, and in 2015 he graduated with a Master’s Degree in Guitar from the Mozarteum University of Salzburg, in Eliot’s Fisk class. Prized winner in competitions such as the First Prize in the international Competition of Gargnano (Italy, 2010), the First Prize in the National Competition of Veria (Greece, 2008), the First Prize in the International Competition of Volos (Greece, 2001), as also the First Prize in the Internationl Festival of Thessaloniki and the Second Prize in the International Chamber Music Competition “Savarez-Corelli” of Salzburg (Austria, 2015) with the “Aeolian Guitar Duo”. He was also awarded by the Guitar Club“Friends of Dimitris Fampas” for his contribution in spreading Dimitris Fampas’ work. He has given many solo and chamber music recitals in Austria and Greece (Megaron Hall of Thessaloniki, Casa dei Mezzo festival, etc. ), he has cooperated many times as a soloist with the Symphonic Orchestra of the Department of Music Science and Art of the University of Macedonia and he has played works for first performance. Since 2014 he belongs to the “Aeolian Guitar Duo” in cooperation with guitarist Vivi Gypari. He has attended classes with Oscar Ghiglia, Roland Dyens, Carlo Domeniconi, Marco Tamayo, Simone Fontanelli, Margarita Escarpa, Timo Korhonen, Isabella Siewers de Pazur, Laura Young, Vangelis Boudounis, Thanos Mitsalas, etc. Since 2005 he has been teaching guitar in conservatories and music schools in Greece. His name has been mentioned in the social media. Comments such as: “…has impressed the audience with his virtuosity…Newspaper Imerisia (Greece), “…artists of this caliber honor the city and make their fellow citizens proud…”Newspaper Ptolemeos (Greece).